Upcoming shows in Destin, Warren OH, Buffalo NY, and Niagara Falls. Sauce Boss Summer Tour took us from Tallahassee to San Diego and back, then up to Maine and back. 11,500 miles on those two runs. And that does not count the flight to Montana and back. Here are some shots from a few of the the gigs, sightseeing, and some food along the way. San Diego Parrothead Club with Washboard Willie. Los Angeles Farmers Market with babes! Jammin with one of the guests at the Volunteers of America Youth Resource Center in Salt Lake City. 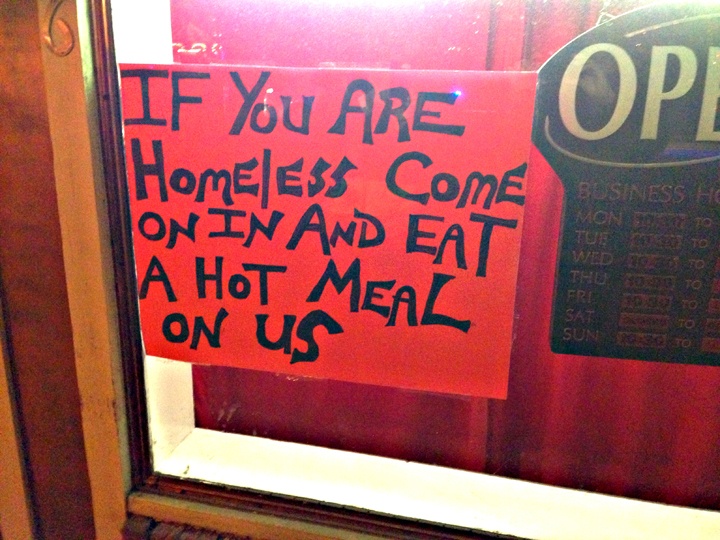 A homeless shelter for teens. These kids are as cool as it gets. Piedra Canyon near Pagosa Springs, Colorado. We spent a couple of days at the hot springs, hiking, soaking and expanding our minds. Santa Fe Holiday. The food, the art, the music, the culture. Beautiful! The Central Oklahoma Parrothead Club in Oklahoma City really threw down on this one. The lovely and Super talented Vanessa Collier joins me at the Greenwood Blues Cruise, bringin down the house. What a spirit this young woman has! Caught red handed! That’s not on my diet!!!! Sittin on the curb, eatin South Carolina BBQ Hash after my set. I just could not resist. When I was a kid, my grandaddy made this stuff. Life is good! Pictograph Caves. Billings, Montana. 2000 year old paintings. Earth Wind and Fire in D.C.
Baby Jake and Walter Tates joining me at Big Owl Tiki Bar. Always epic at Big Al’s place. The Community for Creative Non-Violence. 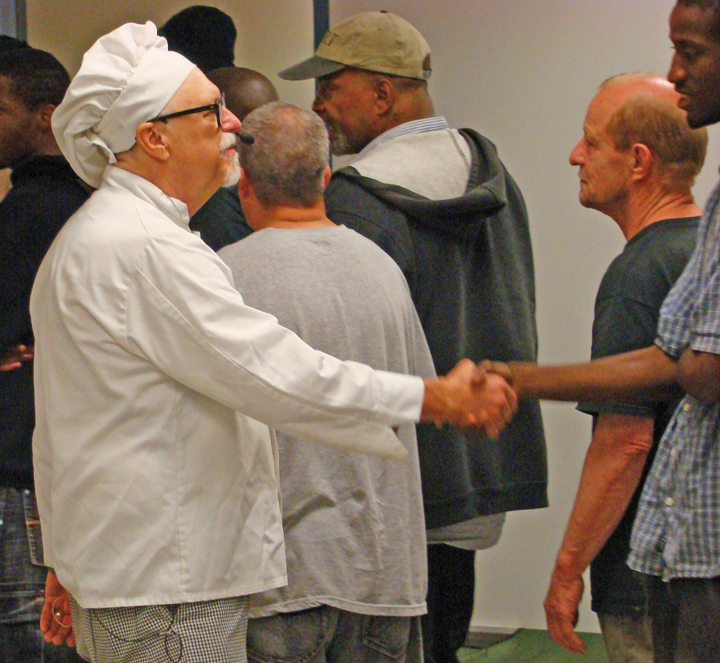 The largest homeless facility in the Country with 1300 clients. For any railroad enthusiast, this is a must see, (hear, feel, experience). The screech of the brakes, the incredible mass of iron surrounding you, the power of half a dozen engines surging round the curve, kinetic, otherworldly. Unlike anything I have ever experienced. The band apartment at Balloons in Ellicottville, New York. Talk about band friendly! Nawlins. Long Island, New York. Black Eyed Salley’s. Hartford, Connecticut. The crowd at the Jimmy Buffett Concert in Mansfield, Mass. Sold out in six minutes! Turner’s Fettuccine with clams and lobster. Salem, Mass. Memorial to those executed for witchcraft. Gettysburg Battlefield. Very dark mojo in this place. There’s still something goin on here. Crystal City, Arlington, Virginia with one of the greats, Walter Tates. A VERY LARGE THANK YOU goes out to all the Gumbo Heads out there who came to the shows this Summer! Without your ears, I would be nothing. Together, we have broken down the barriers between audience and performers, transforming the nights into celebrations of community and love. Keep Cookin! Sauce Boss to be honored. 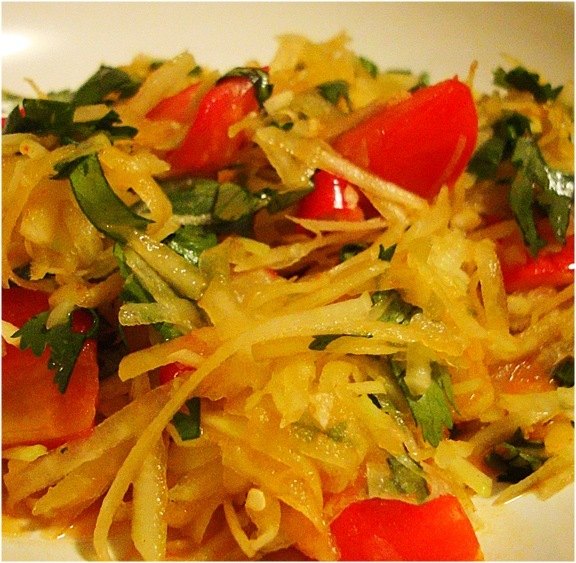 One of my favorite dishes using Liquid Summer Hot Sauce is spaghetti sauce over angel hair pasta. I will use just a little bit, where it’s almost imperceptible. But it marries all the other ingredients together, giving the sauce a character, like almost an identity, a presence that says, “Hello!” without the burn. When I saw the name, I was skeptical. However when I tasted the food, I was a believer in the awesomeness of this little kabob place between Baltimore and DC. (Right near the intersection of I-97 and Hwy 3. It’s a nice ride if you want to avoid the DC traffic) And when you get there, you will be rewarded. …I promise. Once in a great while, a truly great meal comes out of nowhere. A surprise, a sleeper, a complete flabbergast, that hits you up side the head like a brick… of pure flavor. I had a meal like that at this little kabob house between B’more and DC. The name is a play on “Aushak”- an Afghani handmade ravioli stuffed with scallions and leeks, topped with a traditional mint-garlic yogurt dressing, ground sirloin, and cilantro. All meats and vegetables used at the Awe Shack are organic, and the veggies are locally grown. The “Right-out-of-the-tandoor bread” is crazy good. . The quality of ingredients, the attention to detail, and obvious love of cooking makes The Awe Shack truly awesome. Gotta say thanks to all who have congratulated me with the “Bout Time” comments on the social media. When I got the call about the Hall of Fame gig, I was blindsided. I must admit, it was kinda fun to puff up for a couple of days. Feel important, give the big bad world a little “I told ya so”. Then I came back to planet Earth, and the humbling began. I couldn’t have done it without folks who have supported me for all these years. Back when I began my quixotic gumbo crusade, I had no idea that traveling from A to B would involve such an effort. All along the way, some people would tell me, “I would never go up north in the blizzards of winter”. Or, “Don’t you get tired of riding in the van and waiting around in airports”? But for those smiling faces at the gigs, it’s all right here. It’s all right now. Not a rehearsal. This is it, for whatever it will be. I guess I’ve been traveling from A to BE! Yeah, the “Be” is where I ended up. Everything between the A and the B is the “Be”. All for the better. And there’s one person who I must congratulate, and thank more than any other. My friend and companion for my lifetime, Ruth Wharton. On February 25th, we will celebrate our 50th wedding anniversary. I am giggin in Pittsburgh, Pennsylvania, and she will be at my side. Yup, braving the blizzard or the sunshine, we are in it for the long haul. And THAT’S… why I call it the “Haul of Fame”. It’s gorgeous down here in Florida. Nice and warm. So I’m bringin the heat for the holidays. 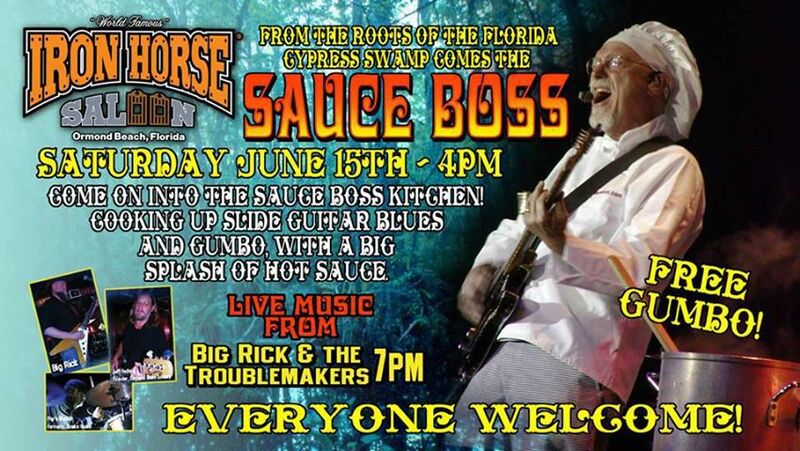 Scorchin Slide Guitar Boogie, Steamin Gumbo, and Liquid Summer Hot Sauce. Comein to ya. I’m takin it to New York, Pennsylvania, Ohio, North and South Carolina. But first. I’m playin Boston’s in Delray Beach. Here’s the info. Planet Gumbo celebrates 14 years of feeding the homeless. I’ve been volunteering my music and gumbo to those in need since 2002. Planet Gumbo is our charitable 501c3 foundation that supports my efforts to bring gumbo and uplifting music to homeless shelters, and soup kitchens all over the country. It’s not hard for me to take a day once and a while and share. However it was a really big deal for this little girl in Jeffersonville, Indiana. And also for the little brother stirrin the gumbo. They had a blast! If you’d like to help: Donate to Planet Gumbo. For All Your Hot Holiday Needs, Order Now! If yer in Orange Beach Alabama or Destin Florida, and ya need a gumbo fix, try Lulu’s. She makes a mighty rad gumbo herself! AAAAWWWW RIGHT! Here I come for my annual Holiday Tour! I am holdin. Loaded with a fresh batch of Liquid Summer Hot Sauce, CDs, and swag. Here’s the details of the tour schedule. I begin the tour at a Homeless Shelter near Louisville. Then I’m gigging in Lexington, Connersville IN, Wheeling WV. Sharon, Pittsburgh, and DuBois PA. Cleveland, Syracuse. I will celebrate my birthday on December 20 in Maryville Tennessee with family and friends. Don’t miss this party! 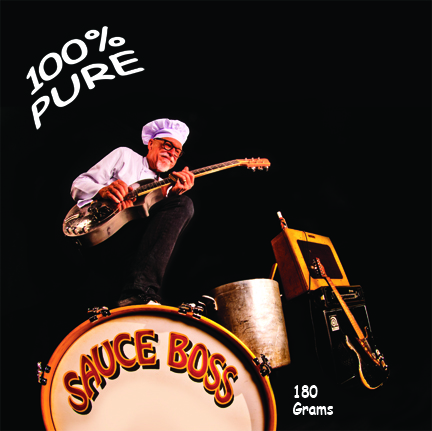 100% PURE Sauce Boss is Smokin! If you haven’t picked up the new album, here’s your chance. Available HERE on CD, or download (or pre-order a limited edition on 180 gram vinyl). This record is getting the best response I ever received from friends and critics alike. 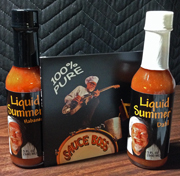 The perfect Holiday Gift Set: Autographed copy of 100% Pure CD and 2 bottles of Liquid Summer Hot Sauce–one Datil and one Habanero. Order— Cds, vinyl, hot sauce, gift sets, t-shirts or chef hats–from the Sauce Boss store, and receive a bonus “cracker jack prize”. 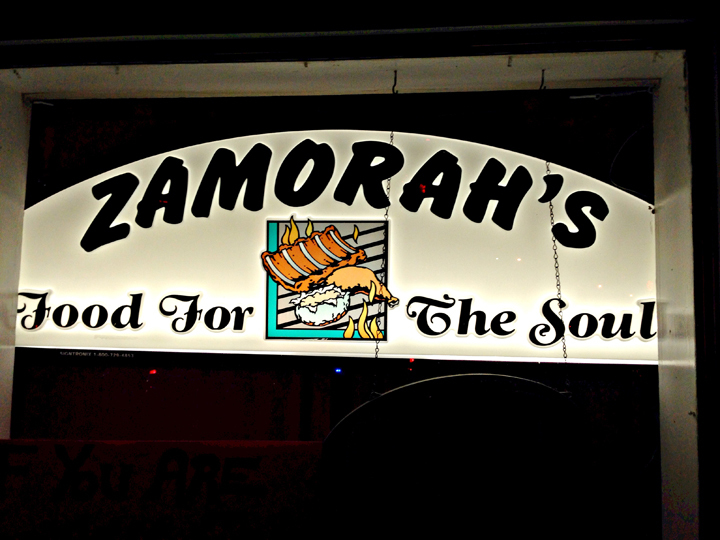 (864) 990-6167 Soul food with a big heart. Why is it that those with little, are ready to share? Could it be that they know how it feels? This little soul food restaurant outside of Greenville, South Carolina blew my mind. Ribs, chicken and the fixins. They bring new meaning to a “generous meal”. Thank you Zamorah! You have made my day, just knowing about what you do for people. We all can help in some way. Happy Holidays Everybody! Spread the love. Gettin to be that time of year when I make my annual holiday tour. I’m ready to hang with my friends in all my favorite places. Places where I have hung for a couple of decades. This time it’s going to be very special for me as I am setting out on a new adventure. On this tour I will be playing solo… So this is the Balls-to-the-Walls Bad Santa tour. Get this. One-man-band style: high energy slide guitar, bass drum, hi-hat, and bass rig makes this show ROCK. CDs, Hot Sauce, LPs, T-shirts, and Chef Hats. The hot sauce for the new millennium. Whatever you do, don’t forget your Liquid Summer Hot Sauce for yer holiday dinner. Just a dash on lox and bagel, does the trick. Put some in the stuffing, and you can mix it with brown sugar to make a glaze for that Christmas ham… Killing me. 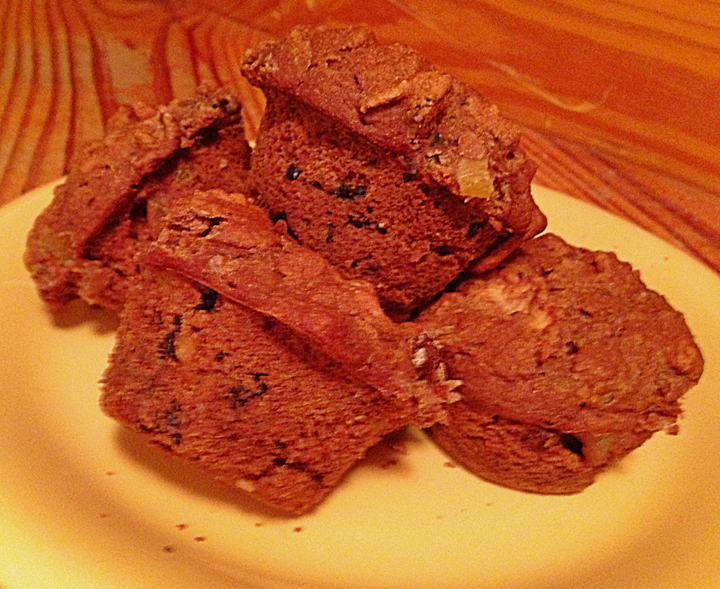 These are the best tasting muffins I have ever made. This recipe needs no sugar. The fruit is all you need. 350 degrees for 45 minutes in a greased muffin pan. Twenty four years and 195,000 bowls ago I started this crazy gumbo crusade. Never charged a penny for my gumbo. Since 2003, I have spent some of my days off playing and cookin in homeless shelters, where I’ve shared my music and a meal with some great folks who happen to be down on their luck. The energy we give and the energy we get from this is incredible for us all. The National Alliance to End Homelessness states that in 2013 there are 633,782 people experiencing homelessness on any given night in the US. 142,168 (22.1%) are children, 62,619 (13%) are veterans, and 269,991 (42.6%) are disabled and unable to work. Planet Gumbo is the non-profit organization whose mission is to bring sustenance in the form of a hearty meal and some uplifting music to soup kitchens and shelters all over the country. Next week I will be playing for the Childrens’s Home Society in West Virginia. Every year we ask for people to support the grassroots efforts of Planet Gumbo. Thanks in advance for your donation. Summer’s about to jump on us, and it’s gonna be a hot one. 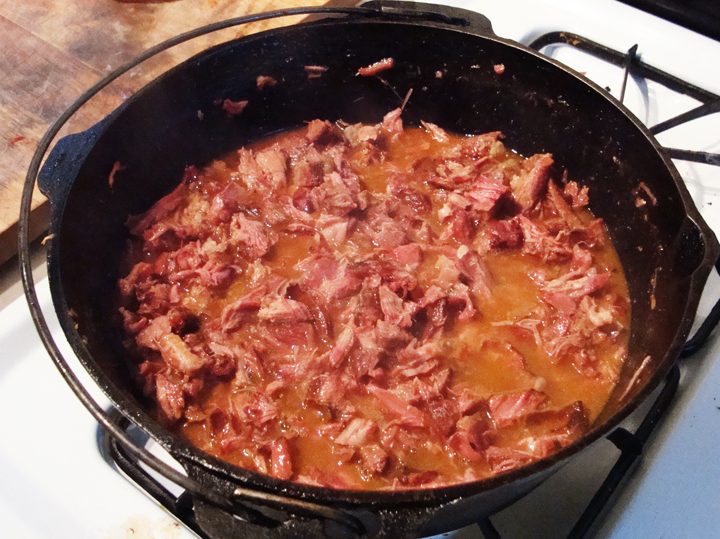 As I promised all my Facebook friends, here’s my recipe for my Grand Daddy’s South Carolina Low Country BBQ Hash. Of course, I have put my own spin on the recipe with my Liquid Summer Hot Sauce. I have many fond memories of my grandfather, William Watts Wharton Sr., AKA “Pop”, used to take out his false teeth and scare the hell out of us little ones. He told war stories from World War I, hunting tales from the turn of the century Florida, and jokes for all the grand kids. Christmas at Mimi and Pop’s was the most magical of times with all the trimmings on a gorgeous tree, surrounded by presents, and an unforgettable feast . Sometimes he would make BBQ Hash, and we would pig out, till our little bellies were tight as ticks. 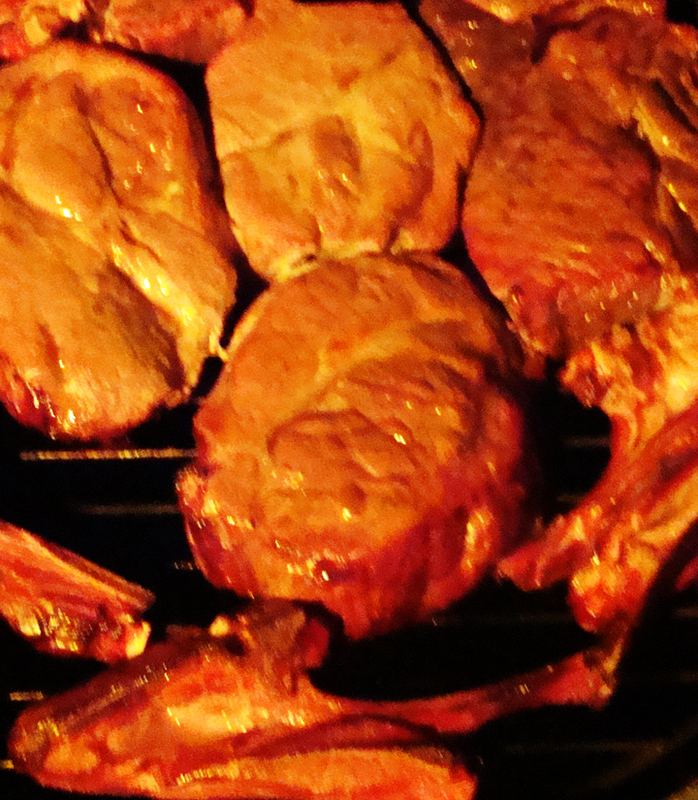 Trim excess fat from meat and smoke it in a charcoal smoker for 3 hours. Cut it up in one inch cubes, and cover with water in a large cast iron pot. Boil the meat until tender. Take the meat out and shred it discarding any bones or fat. Put the meat back into the broth. Add vinegar, chile sauce, honey, and Liquid Summer Hot Sauce. Cook it down till the juice is almost all gone. Serve on a bun with a splash of Liquid Summer and a big slice of onion. Make more than you need, ’cause you will always want more than you have. 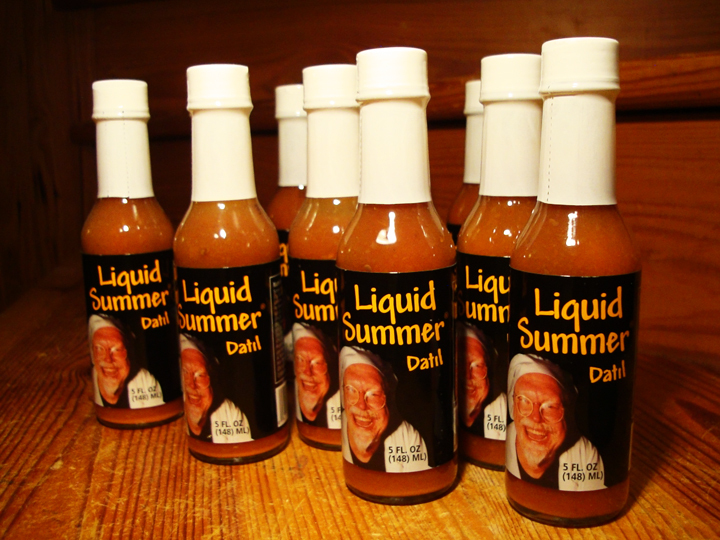 This is what you need for eternal culinary bliss: Liquid Summer Hot Sauce. It comes in the original Datil and Habanero (extra hot) flavors. Get yours HERE. In 1949, Nick Ciriello, the son of a cheese maker, bought a small steak house on North Main Street in Akron, Ohio. As it happened, the simple pasta and pizza recipes became more popular, and so the grill was shut down in favor of the authentic Italian bill of fare. Over 60 years later they are still crankin out the real deal pizza. This ain’t no disco, this ain’t no messin around. These guys know what’s up with the pepperoni. Luigi’s hit the big time in 1972 in Tom Batiuk’s comic strip Funky Winkerbean. 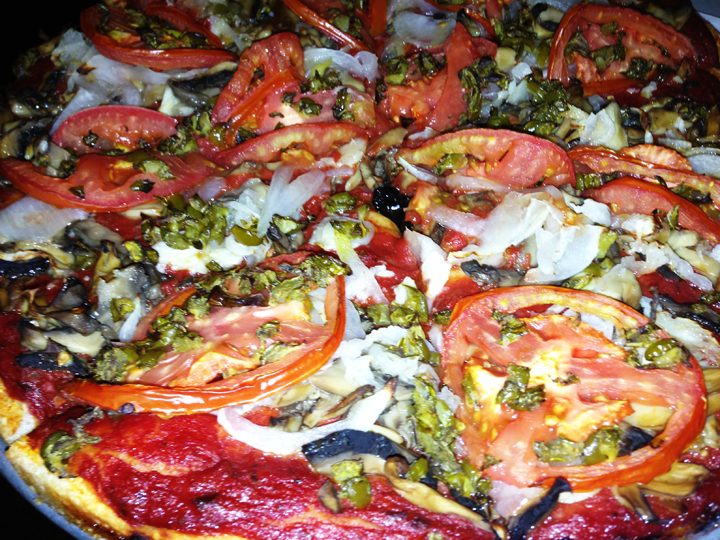 Montoni’s Pizza, the local pizza parlor that Funky co-owned with Tony Montoni, is modeled after Luigi’s Restaurant. Luigi’s is the embodiment of everything Italian. Warm and friendly, accommodating, and very tasty. Let’s Rock. It’s Time to Dime. Lonnie Mack called Skipper’s “The club that washed ashore”. Now celebrating 32 smokin’ years, this venerable Tampa Bay landmark has grown from a small smokehouse takeout operation with a casual Sunday jam to a full-service restaurant and much-loved purveyor of world-class music. The architecture is a smorgasbord of “cracker” and islandy-Key West styles with overturned boats, wooden walkways, large murals dot the landscape while artfully rusted walls contain the sounds of revelry. In the Oyster Bar, a vintage moonshine still hangs over the bar. Raw oysters, smoked mullet, gator tail, fish dip, beer boiled shrimp, black beans and rice, deviled crab, conch fritters, fried okra, and key lime pie, gives this place a real Florida feel. The list of performers who have played Skipper’s is a who’s who of music. And the dance floor is always…interpretive. We will be back to Skipper’s once more on Saturday, April 4th for your dining and dancing pleasure. Y’all come on down to Tampa, ya hear?! New Years Eve 1989, I made gumbo on stage for the first time at a little place north of Tampa. 190,000 bowls of gumbo later, here we are. WOW! What a feeling. Servin up the gumbo night after night got me thinkin that there’s got to be a way to put some of this energy back into the community. So 10 years ago, I discovered Planet Gumbo. A super cool place to dwell. Now I live on Planet Gumbo. I have always liked to share. However on Planet Gumbo, sharing is a way of life. Now when we’re out on the road with a day off, we take the gumbo show to a homeless shelter or a soup kitchen. We have shared a meal and some uplifting music with good people in shelters all over the country. And the good people have shared their stories with us. Please share this story with your friends in your social networks. And follow us on Planet Gumbo’s Facebook page.